Paragon Instructor Certification Program C.I.S. For many of us, Sporting Clays – along with all the other clay target disciplines – is about hitting the target. The “not missing” part – that pretty much applies to all the shooting sports. The problems begin when we miss. Too often, and unfortunately, missing ends up being more than just a problem. A miss becomes a distraction. A distraction that frustrates and usually discourages. All understandable. These emotions can be temporary, or worse, hang around for a while, predictably creating more missing and lowering scores. Years ago, mining my way to becoming an All American, yours truly has been there, done that. More times than I care to remember. Having been around this missing phenomenon for a while, I now look at missing differently. This difference is attributable to my decades of observing the consequences – the shooters suffering from their emotional reactions – quickly followed by yet another miss. These exasperating consequences, however, can very much be avoided – if we adopt a different mindset towards missing. We start by considering that missing isn’t the real problem. It’s how a shooter responds to the miss – that’s the problem. We can engage the miss – start all the self-blaming – and watch our score go down in flames. Or – we can remember why we are standing here – take what we learn from the miss and use it to break the next target. It’s a choice. A choice we have control over. One choice adds more 0’s to our scorecard. The other choice – more X’s. There’s a Truth. Good or bad, depending on how you look at it, each of those outcomes happen in a hurry. As a very busy Instructor and Coach, I teach that every single target missed is a genuine opportunity to learn why we missed. So we can immediately “self-correct” and break the very next target. Predictably. Dependably. A fleeting opportunity we can’t let slip through our fingers. And it will if we aren’t using the miss to our advantage. A miss, BTW, is inevitable and will, in some way, affect our next shot. With the right mindset – being prepared for when that miss happens – moves us a whole lot closer to the next X. It does this by taking us completely around all the unnecessary irritation and self-pity that too often accompanies the miss. Missing is something we may have difficulty controlling, but how we respond to that miss is something we can (and should) control. Many folks shoot thousands of rounds down range for recreation. All perfectly acceptable, if entertainment is the goal? However, if improvement in on the agenda, running in a circle thousands of times won’t get us to Cleveland. To measurably move our shooting skills forward will require adding the basics – along with some patience and self-discipline. Sports, business, the arts and life, this is true for all skill development. That development always comes with trials and errors. What really matters is what we learn and how we use those blunders. Forward or backward? Putting 10 more flats of shells downrange, there will be missing along the way, presenting equally important lessons on how to handle a miss. Precious lessons indeed. A miss is just a flat tire! Fix it and get back in the race. There aren’t enough pages here to list all the folks who’ve built tremendous success on top of a long and exhausting list of failures. The race goes to those who fiercely and tenaciously focus on adding every possible X to their score, not wasting time (or targets) grieving over a miss. A costly luxury that deprives many of a higher score. Since no one gets it right all the time, wouldn’t it make sense to have a better plan the moment a miss occurs? If our goal truly is becoming more consistent in the box and on the target – then putting our miss to work for us just makes good sense. By making every shot count for something – creates a return on every shell invested. Or not. Because – to paraphrase Dr. Bob Rotella – Sporting Clays is not a game of perfect. Every miss we learn something from – puts another X on our scorecard. There’s a Truth. "Lose the target, but don't lose the lesson." Thanks for spending time with us today. Cooler weather ahead! Be safe and I hope to see you out on the course. Please share the links with your fellow shooters. Thank you! Dan Schindler is one of only 60 worldwide members of the Guild of Shooting Instructors (UK) and is one of the most highly respected Sporting Clays and Wingshooting Instructors in the US. Dan is an NSCA Level III Instructor (since 1995) and founded the Paragon School of Sporting with one goal in mind. 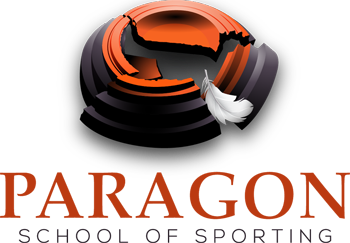 Whether it be for the advanced competitor or providing the basics to the entry-level shooter, Paragon provides the simplest, most practical and most effective Instruction, Coaching and Mental Training for the Sporting Clays & Wingshooting enthusiast. Dan Schindler helps shooters alleviate a lot of their frustration by taking the mystery out of breaking targets, calling their own misses and make their own corrections. Lessons are fun, enlightening and our clients learn to shoot better in minutes! Take Your Best Shot (Book I) is all about the fundamentals, a requirement for good shooting. To The Target (Book II) Builds on the steps outlined in Book I. Emphasises Gun Management skills when the trap fires, creating a consistent, reliable, trustworthy swing. Beyond the Target (Book III) is for shooters of all levels, filled with valuable information, clay target truths. Entertaining and a culmination of 3 decades of Dan' life's work as a teacher, competitor, published writer and much more. Copyright 2019 Paragon School of Sporting, Inc.